The candidate experience describes the individual experience of an applicant with a company. It includes both positive and negative experiences during the process. Develop a candidate journey containing each touchpoint the applicant has with the company during the process to catalogue the touchpoints and improve them systematically. If one dimension is missing, the candidate experience at your company is lacking. It’s simple, but not easy. An important note: the third dimension is the most important. 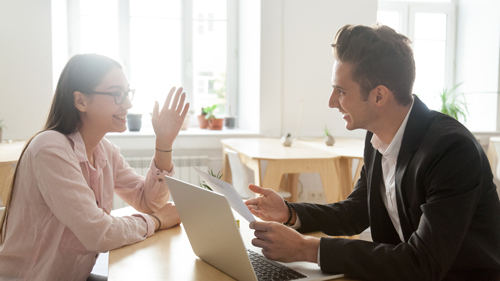 If the applicant has an unpleasant experience during the interview, any positive impressions from the first and second dimensions lose relevance. Who are we dealing with? The first step is to create a persona profile to help you understand the needs of your applications. Define one to three typical applicants for your company. Use your imagination and visualise these people with names, ages, jobs, interests, appearance, and marital status on a flipchart with words and pictures. Use the candidate journey to develop measures to optimise your recruiting process sustainably. Ask your candidates for feedback on how to improve the process. Follow these steps, and you are sure to improve your recruiting success.